Shred: The Revolutionary Diet, combines doctor and author, Ian K. Smith’s experience and concepts from his previous books to create a powerful, strategic weight loss plan. Dieters have lost an average of twenty pounds in six weeks by following the Shred program. Shred combines a low glycemic diet with meal replacements and structured meal spacing. Dieters consume four small meals and three snacks a day for the duration of the program. You will be eating something approximately every three hours. The program consists of a cycle of six-weeks. However, you may need to do more than one cycle to achieve your goals. Each week is laid out in detail with guidelines on what you should eat and your exercise requirement for each day. Shred is based on the concept of “diet confusion”, which tricks your body and enhances its performance. By switching up your food intake each week you keep your metabolism revved up and increase weight loss. The first week primes you for success for the rest of the program. You will begin to pay attention to meal timing, eating something every three to four hours. You will start to reduce your calorie intake during the challenge week. By the end of this week you should really start to see progress. This is the most difficult week where you will reduce your calories even further. It is designed to make you break through a weight loss plateau. Since you have already completed the toughest week this phase will come as a relief. You will continue to work hard but it won’t feel as strenuous as it did before.This week reinvigorates and energizes you to finish the rest of the cycle at full speed. The cleanse week focuses on enhancing your liver’s ability to detoxify your blood.Certain foods can provide this boost by activating special enzymes in the liver that facilitate the elimination of toxins. At this point you can use all you have learned to explode into a new healthy weight management lifestyle. Egg whites, chicken breast, lean beef, turkey, fish, bacon, low-fat milk, soy milk, almond milk, oatmeal, whole grain bread, brown rice, lentils, black beans, chickpeas, sunflower seeds, lettuce, tomato, broccoli, green beans, asparagus, sweet potato, blueberries, pear, grapefruit, diet soda. You are provided with exercise goals for every day of the Shred Diet. You have the choice to complete all of the required exercise at once or break it up into shorter sessions. For the first cycle you should only do cardio exercise. After that it is recommended to incorporate resistance training because it boosts metabolism, which increases the rate of calorie burning. 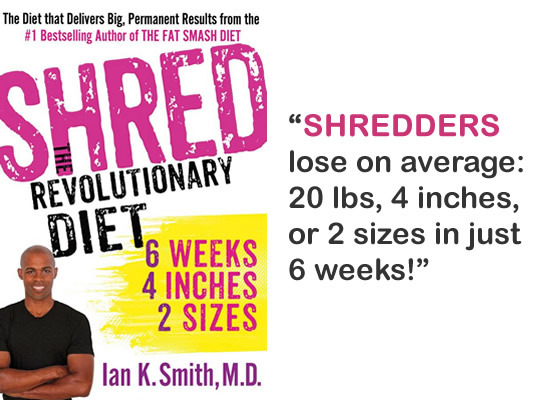 Shred: The Revolutionary Diet: 6 Weeks 4 Inches 2 Sizes retails at $15.99. Can help dieters break through plateaus. Altering calorie intake and activity levels each week boosts metabolism. Variations in the weekly routines help prevent boredom and maintain motivation. Food choices can be adapted to suit individual preferences. Shred Diet includes recipes for smoothies, protein shakes, soups and stews. Some dieters may find the plan overly complicated and prefer a simpler approach. May involve extra time for planning and preparing meals. Exercise program may be too strenuous for dieters who are not physically active. Shred Diet encourages consumption of diet soda, which has been linked to unfavorable weight loss outcomes. Shred Diet is based on the idea of “diet confusion” where altering your calorie intake tricks your body. Shred can prevent the slow down of metabolism that is common with prolonged low calorie dieting. As such it can assist dieters to break through plateaus and produce more effective weight loss results than standard diets. Dr. Ian K. Smith, M.D., is a number one bestselling author of “The Four Day Diet“, “The Fat Smash Diet” and the “Extreme Fat Smash Diet”.